Begin by talking to Larrissa near the Lighthouse north of the Barbarian Outpost. First off, head to the lighthouse located northwest of the Barbarian Outpost by jumping across the Basalt Rocks on the coast until you reach a cliff-like island. Head north to the Lighthouse and talk to Larissa who asks for your help. Ask her what you can help her with, and she explains about her boyfriend being missing, and she'll tell you to visit her cousin to see if he can help. Now head back to the Barbarian Outpost and go in through the gate. Now climb through the Pipe to the south and talk to Gunnjorn the Barbarian near the house to the southwest. He should give you a Lighthouse Key, which will allow you to get into the Lighthouse. Now you'll need 2 Planks, 60 Steel Nails and a Hammer to fix the bridge. Planks can be found just to the north of the outpost, and Steel Nails can be either Smithed, bought from the Varrock sawmill operator, or traded. Go back to the Lighthouse and head southeast along the path until you reach a broken bridge. Use a plank with each side of the bridge to repair it, and then head back to Larissa. After speaking to her, go inside of the Lighthouse and head up the staircase. Search the bookcase, take all 3 books and read through them. Go up the stairs and use some Swamp Tar with the Lighting Mechanism. Use a Tinderbox with the mechanism to light it, and then use some Molten Glass with it to fix the light. Climb down the ladder to the main floor, and then climb down the Iron Ladder to find a basement. On the north wall should be a Strange Wall, which you need to use 1 of each Elemental Rune, as well as any type of Arrow and Sword with it to open. Remember, you won't get any of these items back later. Now open the Strange Wall and climb down the Iron Ladder to find a cavern, as well as Jossik who seems to be injured. Talk to him, and he says that a monster attacked him. You'll then be attacked by a level 100 Dagannoth, and after killing it speak to Jossik again and you'll be attacked by another, meaner, level 120 Dagannoth Mother. At first the Dagannoth Mother is vulnerable to all attacks and then she will be vulnerable to water spells, so to make it easier on yourself go into the fight autocasting water spells. 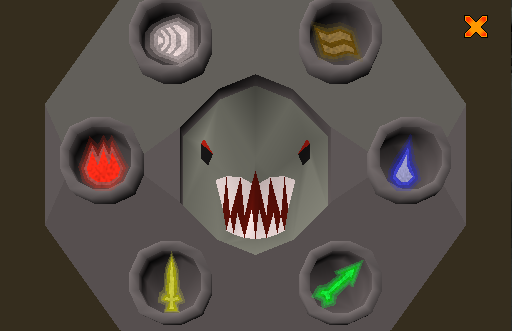 The Dagannoth Mother most often attacks using melee, so using your Protect From Melee prayer (if available) is useful since her melee attack seems to be the most powerful of the three. However, it's important to note that whenever you use one protect prayer, the Dagannoth Mother will switch her attack style to another type. You cannot stand behind a stalagmite and wait for the mother to become vulnerable to a ranged or magic attack. If you do this she will not change weaknesses and eventually walk away. After killing the Dagganoth Mother, you'll find a Rusty Casket, and you will find yourself just outside of the Strange Wall. 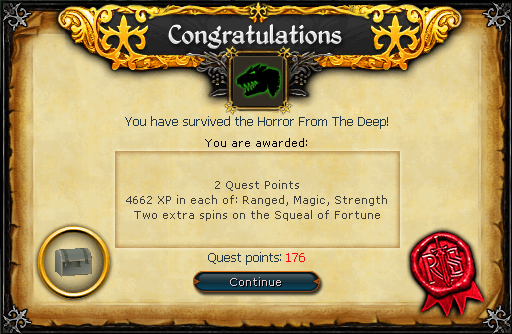 Your quest is complete! After killing the Dagannoth Mother, you will receive a Rusty Casket. Bring this to Jossik, who is located upstairs in the library. He will ask you what it says, and you'll have the chance to choose one of the three main Gods: Saradomin, Guthix, or Zamorak. After you confirm your choice, you will receive a Damaged Book of the selected god. Once you have completed one book, you may speak to Jossik and purchase another Damaged God Book from him for 5,000gp. Along with the "main" God books you could initially purchase, you will also have the option of purchasing books devoted to Armadyl, Bandos, and Zaros. If you ever lose one of your God Books, you can speak to Jossik to get it back, with any added pags intact.